We got going at 6:45am back on the Tonto West Trail. Again, this is an alternate route that adds 27mi and stays off a long road walk. We saw two groups heading the opposite direction this morning and a group at a campsite. Then no one the rest of the day. We have 40mi on this trail before reaching the hitching point to cross the Colorado tomorrow. It is difficult to time the hiking and the hitching when aren’t sure how fast the Tonto West miles would go. Reportedly, the best time to get the hitch across the river is late morning through early afternoon. Just maybe a handful of rafts go through there a day and apparently not the latter half of the day. If we could do more than 20mi today, it would have us in reach of getting to the river possibly early enough for a hitch tomorrow. If not, we will just camp near the river tomorrow night and hang out the next morning waiting for a raft to come by. We didn’t want to push today, but figured we’d at least hit 20mi given that the Tonto East trail has been so fast on the other side last leg…well, it wasn’t as easy as we’d hoped. The trail today was more tiring and slow going than we expected. We were able to maintain a 2mph pace, but it was tiring. Just like the Tonto East trail, the West Trail wove in and out of side canyons that came off the Colorado River. 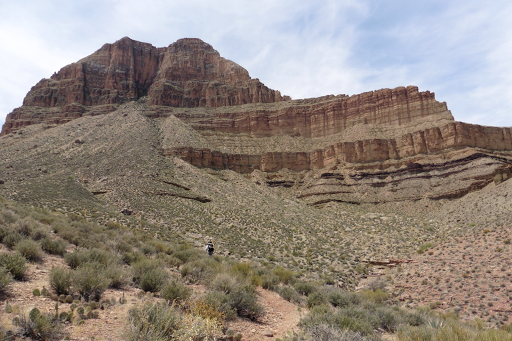 The main difference here is that on this side, the Tonto trail contours less, and goes up and down more on a bit rockier terrain. With 8 days of food, this made for some tiring ups and downs. Add to that, increased heat, bigger water carries, and the first day of my period and we have a pretty lethal combination for uncomfortable hiking. I’m worn out. 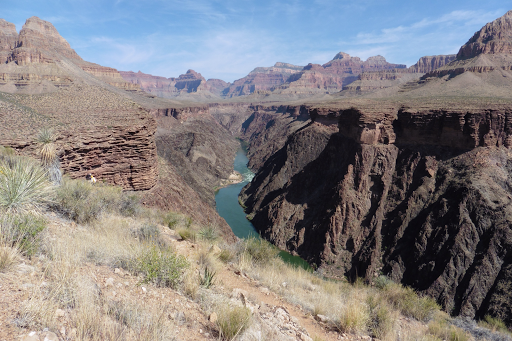 The heat is more than it has been, but still not at the height of the Grand Canyon’s regular May temps. It just made things a bit more uncomfortable and increased the water carries. Fortunately, there was some light clouds filtering the sun a bit and some breezes much of the day. The highest we noticed at a break was that my thermometer was reading upper 90s in the shade. 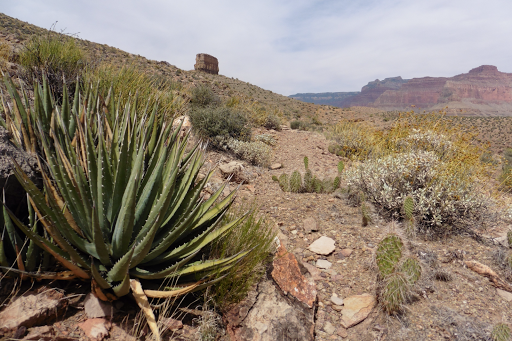 The trail today was more narrow and had many of the the desert’s unforgiving plant life hanging over the trail frequently. In the afternoon, I gave in and put my pant legs back on because I was getting too scratched up. There were also plenty of cacti to dodge hanging over the trail. Here is a photo of my least favorite plant out here. I think it’s called agave. It looks like a yucca, but is much more evil! It has very very sharp points, is quite rigid, and has those addition teeth on the edges. It’s been around since the end of last leg and I stabbed myself in the lower thigh with one a few days ago. It bled a good bit, swelled, and bruised. We learned in town that Katherine had a run-in with one on her wrist and is having a bad reaction of blistering of some sort and pain. It apparently has a chemical in it or something that causes a reaction. Last night, I clumsily walked into one and it stabbed me in the shin fairly deep and broke off sticking into my leg through my pant leg. It was in there good and I had to pull at it twice to get it to come out. Still brings chills the feeling of pulling it out as it seemed to grip into my leg. Though only a small puncture, it hurt from my lower ankle to my knee last night. Today, it was slightly bruised and was more swollen along a good three inches of my shin. It is fine now and healing with a bit of swelling, but these plants are officially my least favorite! The scenery is much of the same and I took few photos today. We only saw the Colorado a couple times and spent much of the day weaving deep back into canyons and then back out. This area is called “The Gems” because some of the side canyons are named after gems…Topaz, Ruby, Agate, Turquoise, Sapphire…honestly, they all look pretty much the same. With the extended mindless terrain that is rare on the Hayduke, I was able to listen to many hours of the 20hr audiobook, We Are Not Ourselves and it’s been a good one to listen to on trail. Water is of concern. There is a 27mi water gap between fully reliable canyons, but a week and a half ago, water was reportedly still barely in the Gems as a trickle or some pools that have yet to evaporate. 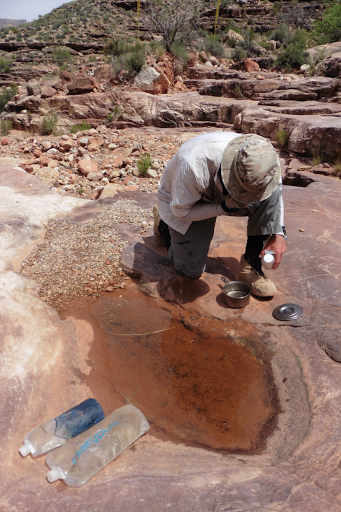 We got our last source today from a small pool filled with bugs, debris, and tadpoles. After seeing just that pool and no running water, I didn’t want to risk it, and carried 5L(10lbs) of tadpole water out the final six miles of the day in case we didn’t see water again until the Colorado tomorrow. Gavin chose to roll the dice and took 3L. I was drained by the time we reached our 20mi mark just before 6pm and we decided to call it a day and accept that we won’t probably get a hitch tomorrow. That was the original conservative plan from the beginning. It turned out that our final destination canyon did have water, so I got to dump out the tadpole water I’d carried for three hours and get much better water. I was a small, yet wonderful flow. We were soooo happy that this canyon was shaded and I got to setup my tent early and LAY DOWN. It’s just barely 9pm and I’m excited to end this day with an episode of House of Cards…good night.